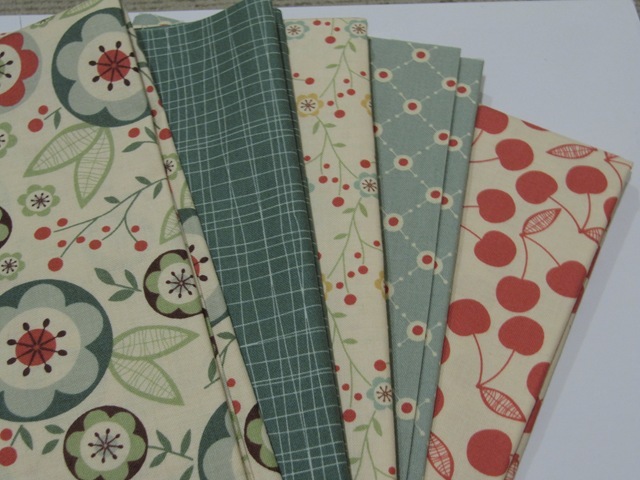 Back in 2010 I fell in love with Cosmo Cricket’s ‘Early Bird’ fabric collection. I eagerly bought some to make a picnic quilt which we’d use when going on bike rides. Not long after the fabric arrived I dropped in to visit my Great Aunt Melva on what would actually be the last time I saw her in her home. I told her about the quilt and she said she had some green cotton that might do for the back and did I want to see it? I did and the cotton was a perfect match. I don’t have a photo of the cotton; it’s the colour of the light green. Life changed; I found out I was pregnant and stopped sewing for a year, Melva sadly grew sick and passed away at the very end of 2010 (on NYE). The fabric sat in piles waiting. 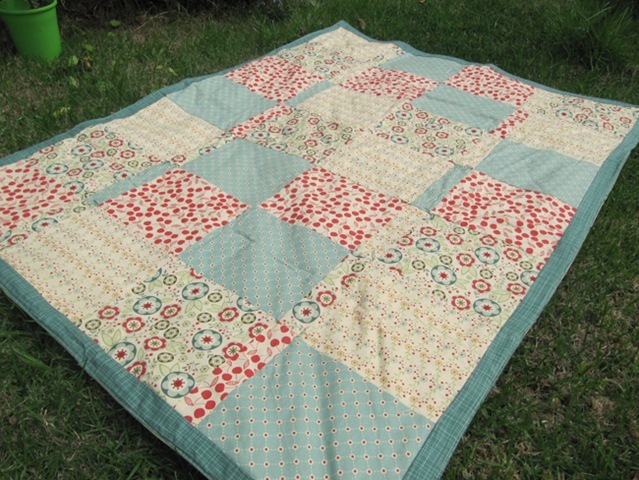 In late 2011 I finally started to cut out rectangles to make the quilt. I didn’t use a pattern and just went with what felt right. When I dug out the fabric Melva had given me I established that the fabric was a) quite old, b) had sat exposed to light as it has uneven discolouration, and c) provided a tasty snack for a critter judging by the little holes in it. 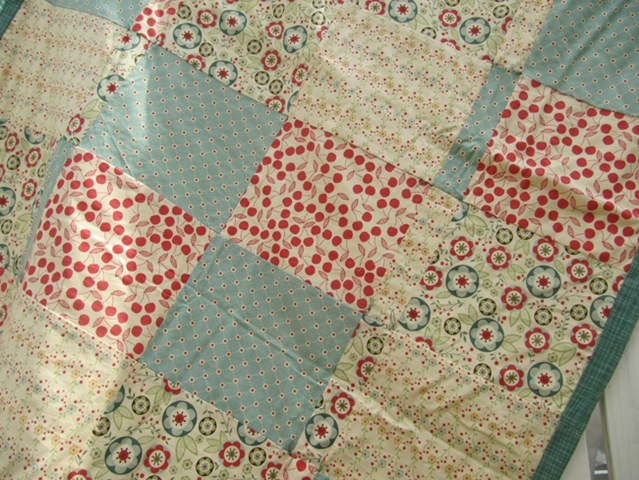 I wasn’t deterred by these little imperfections though and it looks really nice on the back of the quilt. I used polar fleece for the batting mainly because I have an abundance of it and it’s easy to wash and dry. 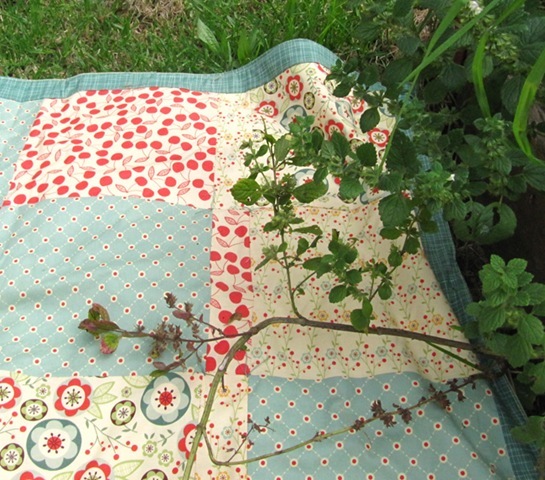 I decided against quilting the ‘blanket’ as I didn’t want it to look look like I’d grabbed something off the bed to go picnicking with, instead it is hand tied which make it look a bit more casual. The quilt was finally finished at the end of March. I can’t wait to try it out. Let’s hope these lovely Autumn days stick around for a bit longer. Lovely work Ren! Gorgeous colours! I can see why you loved the fabric! Nice work.